Alexander Khromykh received his BSc degree from the Tomsk State University, Russia, and his PhD degree in Molecular Virology from the State Centre for Virology and Biotechnology, NPO Vector”, Russia. He worked as Postdoctoral Fellow at the University of Ottawa in Canada. 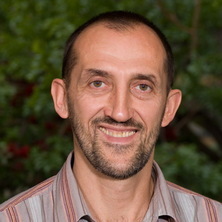 He then joined Sir Albert Sakzewski Virus Research Centre in Brisbane in 1992 and became a laboratory Head in 2001. He moved his laboratory to St Luica campus in 2005 to take an appointment with the School of Chemistry and Molecular Biosciences (SCMB). He was the founding Director of the SCMB’s Centre for Infectious Disease Research and is currently the Deputy Director of the Australian Infectious Diseases Research Centre. Roby, Justin A., Funk, Anneke and Khromykh, Alexander A. (2012). Flavivirus replication and assembly. In Pei-Yong Shi (Ed. ), Molecular virology and control of flaviviruses (pp. 21-49) Norfolk, United Kingdom: Caister Academic Press. Khromykh, Alexander A., Chang, David C. and Hall, Roy A. (2009). Vaccine development against West Nile Virus. In Diamond, Michael S. (Ed. ), West Nile Encephalitis Virus Infection: Viral Pathogenesis and the Host Immune Response 1st ed. (pp. 427-451) New York: Springer Science + Business Media. Westaway, E. G., Mackenzie, J. M. and Khromykh, A. A. (2002). Replication and gene function in Kunjin virus. In J. S. Mackenzie, A. D. T. Barrett and V. Deubel (Ed. ), Japanese Encephalitis and West Nile Viruses (pp. 323-352) Berlin: Springer. Last 20 aa of the West Nile virus NS1' protein are responsible for its retention in cells and the formation of unique heat-stable dimers. Prow, Natalie A., Khromykh, Alexander A. and Hall, Roy A. (2009) West Nile virus: The current climate. Medical Laboratory Observer, 41 4: 10-15. Hall, RA and Khromykh, AA (2007) Drug evaluation: ChimeriVax-West Nile vaccine. Current Opinion In Molecular Therapeutics, 9 5: 498-504. Tetracycline-Inducible packaging cell line for production of Flavivirus replicon particles. Replicon-based vectors of positive strand RNA viruses. Khromykh, A. A. (2000) Replicon-based vectors of positive strand RNA viruses.. Current Opinion in Molecular Therapeutics, 2 5: 555-569. Khromykh, Alexander A., Sedlak, Petra L., Guyatt, Kimberley J., Hall, Roy A. and Westaway, Edwin G. (1999) Efficient trans-complementation of the flavivirus kunjin NS5 protein but not of the NS1 protein requires its coexpression with other components of the viral replicase. Journal of Virology, 73 12: 10272-10280. Khromykh, Alexander A., Sedlak, Petra L. and Westaway, Edwin G. (1999) trans-complementation analysis of the flavivirus Kunjin ns5 gene reveals an essential role for translation of its N-terminal half in RNA replication. Journal of Virology, 73 11: 9247-9255. Khromykh, Alexander A., Kenney, Mark T. and Westaway, Edwin G. (1998) trans-complementation of flavivirus RNA polymerase gene NS5 by using kunjin virus replicon-expressing BHK cells. Journal of Virology, 72 9: 7270-7279. Khromykh, Alexander A., Varnavski, Andrei N. and Westaway, Edwin G. (1998) Encapsidation of the flavivirus kunjin replicon RNA by using a complementation system providing kunjin virus structural proteins in trans. Journal of Virology, 72 7: 5967-5977. Westaway, Edwin G., MacKenzie, Jason M., Kenney, Mark T., Jones, Malcolm K. and Khromykh, Alexander A. (1997) Ultrastructure of Kunjin virus-infected cells: Colocalization of NS1 and NS3 with double-stranded RNA, and of NS2B with NS3, in virus-induced membrane structures. Journal of Virology, 71 9: 6650-6661. Khromykh, A. A. and Westaway, E. G. (1997) Subgenomic replicons of the flavivirus Kunjin: construction and applications. Journal of Virology, 71 2: 1497-1505. Khromykh, A. A., Meka, H. and Westaway, E. G. (1995) Preparation of recombinant baculovirus by transfection of a ligated cDNA fragment without prior plasmid amplification in E. coli. BioTechniques, 19 3: 356-358+360. Khromykh, A. A. and Westaway, E. G. (1994) Completion of Kunjin virus RNA sequence and recovery of an infectious RNA transcribed from stably cloned full-length cDNA. Journal of Virology, 68 7: 4580-4588. Khromykh, A. A., Beliaev, A. S., Rukavishnikov, M. I., Daniliuk, N. K. and Sandakhchiev, L. S. (1990) Expression of antigens of the tick-borne encephalitis virus by various recombinant variants of the vaccinia virus Ekspressiia antigenov virusa kleshchevogo éntsefalita razlichnymi rekombinantnymi variantami virusa ospovaktsiny. Doklady Akademii nauk SSSR, 310 4: 996-999. Liebscher, Susan, Chappell, K. J., Stoermer, Martin J., Watterson, Daniel, Webb, Richard I., Khromykh, Alexander A., Fairlie, David P. and Young, Paul R. (2010). Sneaking up on West Nile Virus NS2B/NS3 protease subcellular activity utilising dye-quenched substrates. In: PlusStrand 2010: The Ninth International Symposium on Positive-Strand RNA Viruses, Atlanta, GA, U.S.A., (88-88). 17-21 May 2010. Evasion of host innate immune response by West Nile virus. Khromykh, A. (2009). Evasion of host innate immune response by West Nile virus.. In: TLROZ 2009: Patterns Recognition Receptors in Health and Disease, Surfers Paradise, Australia, (). 28-30 October 2009. Funk, A., Torres, S., Edmonds, J., Pijlman, G., Hall, R., Lobigs, M., Kumagai, Y., Takeuchi, O., Akira, S. and Khromykh, A. (2009). Flavivirus subgenomic non-coding RNA is required to overcome the host innate immune response. In: 5th Australian Virology Group Meeting, Lorne, Australia, (). 13-17 December 2009. Martens, E., Iteman, I., Frenkiel, M.-P., Simon-Chazottes, D., Funk, A., Khromykh, A. and Kajaste-Rudnitski, P. (2009). Molecular basis for the resistance of West Nile virus to antiviral activity of Oas1b. In: 28th Annual Meeting of American Society for Virology, Vancouver, Canada, (). 11-15 July 2009. Funk, A., Torres, S., Truong, K., Edmonds, J., Pijlman, G., Hall, R., Lobigs, M., Kumagai, Y., Takeuchi, O., Akira, S. and Khromykh, A. (2009). The role of flavivirus subgenomic non-coding RNA in overcoming host innate immune response. In: TLROZ 2009: Patterns Recognition Receptors in Health and Disease, Gold Coast , Australia, (). 28-30 October 2009. The role of pseudoknot interactions in stabilizing flavivirus RNA structure and generation of nuclease resistant flavivirus RNA. Truong, K., Funk, A., Torres, S. and Khromykh, A. (2009). The role of pseudoknot interactions in stabilizing flavivirus RNA structure and generation of nuclease resistant flavivirus RNA.. In: 5th Australian Virology Group Meeting, Lorne, Australia, (). 13-17 December 2009. The role of small subgenomic RNA in flavivirus replication and pathogenicity. Khromykh, A. (2009). The role of small subgenomic RNA in flavivirus replication and pathogenicity.. In: NITD Conference on Dengue, Manila, Philippines, (). 31 Aug - 4 Sept 2009. Khromykh, A., Funk, A., Torres, S., Edmonds, J., Pijlman, G., Hall, R., Lobigs, M., Kumagai, Y., Takeuchi, O. and Akira, S. (2009). The role of subgenomic non-coding RNA in flavivirus-host interactions and viral pathogenicity. In: 28th Annual Meeting of American Society for Virology, Vancouver, Canada, (). 11-15 July 2009. Khromykh, A.A. (2008). Flavivirus replication and cellular RNA decay machinery. In: 3rd AREVA-Pasteur Forum "Mosquito- and tick-borne viruses and their environment, Shanghai, China, (). 12-14 June, 2008. Pijlman, G.P., Funk, A., Kondratieva, N., Leung, J., Van der Aa, L., Liu, W., Palmenberg, , A.C., Hall, R.A. and Khromykh, A. (2008). Flavivirus subgenomic RNA generated by the mRNA decay machinery supports efficient virus replication. In: American Society for Virology Annual Meeting, Ithaca, USA, (). 12-16 July, 2008. Pijlman, G.P., Funk, A., Kondratieva, N., Leung, J., Van der Aa, L., Liu, W., Palmenberg, A.C., Hall, R.A. and Khromykh, A.A. (2008). Flaviviruses employ cellular mRNA decay machinery to generate subgenomic non-coding RNA required for pathogenicity. In: International Congress of Virology, Istanbul, Turkey, (). 10-15 Aug, 2008. Funk, A., Pijlman, G.P., Kondratieva, N., Leung, J., Van der Aa, L., Liu, W., Palmenberg, A.C., Shi, P.-Y., Hall, R.A. and Khromykh, A. (2008). Flaviviruses employ cellular mRNA decay machinery to generate subgenomic non-coding RNA required for pathogenicity. In: Arbovirus Research in Australia Meeting, Coffs Harbour, Australia, (). 15-19 Sept, 2008. Pijlman, G.P., Funk, A., Kondratieva, N., Leung, J., Van der Aa, L., Liu, W., Palmenberg, A.C., Hall, R.A. and Khromykh, A.A. (2008). The role of small non-coding RNAs in flavivirus replication and pathogenicity. In: Society for General Microbiology Meeting, Edinburgh, Scotland, (). 31 Mar - 3 Apr, 2008. Mackenzie, J M, Khromykh, A and Parton, R G (2006). Cholesterol is good, just ask the flaviviruses. In: Annual Scientific Meeting & Exhibition - Aust Society for Microbiology. Annual Scientific Meeting & Exhibition - Aust Society for Micry, Gold Coast, (Abstract). 2-6 July, 2006. Khromykh, A (2006). Flavivirus replication and virus-host interactions. In: Annual Scientific Meeting & Exhibition - Aust Society for Microbiology. Annual Scientific Meeting & Exhibition - Aust Society for Micr, Gold Coast, (Abstract). 2-6 July, 2006. Mackenzie, J M, Liu, W, Parton, R G and Khromykh, A (2006). Inhibition of interferon signaling in flavivirus-infected cells is associated with virus-induced cholesterol re-distribution. In: 13th International Mtg on Hepatitis C Virus & Related Viruses. 13th International Mtg on Hepatitis C Virus & Related Viruses, Cairns, (Abstract). 27-31 Aug, 2006. Anraku, I., Mokhonova, V., Rattanasena, P., Pijlman, G P, Suhrbier, A and Khromykh, A (2006). Kunjin replicon vectors for HIV/SIV vaccine development. In: Aust Centre for HIV & Hepatitis Virology Research. Aust Centre for HIV & Hepatitis Virology Research, Lorne, (Abstract). 8-11 Oct, 2006. Khromykh, A, Liu, W, Wang,, Clark, D. C. J. and Hall, R A (2006). Modulation of interferon response by West Nile. In: Keystone Symposia. Keystone Symposia, Keystone, Colorado, (Abstract). 6-11 Jan, 2006. Mackenzie, J. M., Khromykh, A. and Parton, R. G. (2005). A bigmac a day keeps the flavivirus away. In: 3rd Australian Virology Group Meeting. 3rd Australian Virology Group Meeting, Phillip Is, (31-31). 9-12 Dec, 2005. Liu, W., Wang, D.Z., Clark, M., Lobigs, M. and Khromykh, A. (2005). A single amino acid in the West Nile virus nonstructural protein NS2A disables its ability to inhibit interferon alpha/beta induction and attenuates virus virulence in mice. In: 3rd Australian Virology Group Meeting. 3rd Australian Virology Group Meeting, Phillip Is, (31-31). 9-12 Dec, 2005. Khromykh, A. (2005). Kunjin (West Nile) virus-based vaccines. In: Novel vaccines against infectious diseases - Developed countries meet developing countries. Novel Vaccines Against Infectious Diseases, Semmering, Austria, (Abstract). 14-17 April, 2005. Pijlman, G. P. and Khromykh, A. (2005). Requirement of flavivirus Kunjin NS3 translation in cis for packaging of viral RNA. In: 24th Annual Meeting of American Society for Virology. 24th Annual Meeting of American Society for Virology, Pennsylvania, (136-136). 18-22 June, 2005. Leung, J, Mackenzie, J. M., Khromykh, A. and Pijlman, G. P. (2005). The role of the nonstructural protein NS2A in flavivirus assembly. In: 3rd Australian Virology Group Meeting. 3rd Australian Virology Group Meeting, Phillip Is, (35-35). 9-12 Dec, 2005. Mackenzie, J. M., Khromykh, A. and Parton, R. G. (2005). West Nile manipulates cholesterol balance affecting the lipid raft formation and function. In: 24th Annual Meeting of American Society for Virology. 24th Annual Meeting of American Society for Virology, Pennsylvania, (176-176). 18-22 June, 2005. Clark, D. C., Khromykh, A. A., Mackenzie, J. S. and Hall, R. A. (2001). Identification of a region of the flavivirus nonstructural protein 1 (NS1) involved in dimerization. In: 1st Australian Virology Group Meeting. 1st Australian Virology Group Meeting, Fraser Island, (P1.39-P1.39). December, 2001. Cartwright, L., Hall, R. A., Khromykh, A., Poidinger, M. and Mackenzie, J. S. (2001). The role of conserved RNA structures in the untranslated regions of the flavivirus genome in viral replication. In: Programme and abstracts, 8th Arbovirus Research in Australia Conference. 8th Arbovirus Research Symposium, Couran Cove, Qld, (36 (Abstract)). 3-7 July, 2000. Cartwright, L., Hall, R. A., Khromykh, A. A., Mackenzie, J. S. and Poidinger, M. (1999). Investigation of the structure and function of the flavivirus non-coding regions. In: Abstract Book, 11th International Congress of Virology. 11th International Congress of Virology, Sydney, (251). 9-13 August 1999. Hall, R. A., Khromykh, A. A., Poidinger, M., Scherret, J., Mackenzie, J. M., MacKenzie, J. S. and Khromykh, T. (1999). Loss of dimerisation of the NS1 protein of Kunjin virus slows replication in cell culture and reduces virulence in mice. In: Abstract Book, 11th International Congress of Virology. 11th International Congress of Virology, Sydney, (121). 9-13 August 1999. Scherret, J., Khromykh, A. A., Calvert, A. E., Mackenzie, J. S. and Hall, R. A. (1999). The effect of glycoslation of the envelope protein in Kujin replication and pathogenesis. In: Abstract Book, 11th International Congress of Virology. 11th International Congress of Virology, Sydney, (252). 9-13 August 1999. A sensitive, high resolution QTOF mass spectrometer with nanoUPLC system for qualitative and quantitative biomolecule analysis. Wolbachia and West Nile virus in mosquitoes: friends or foes? Do insect-specific flaviviruses regulate the transmission of mosquito-borne diseases in Australia? Mass spectrometer for biomolecule discovery, structural analysis and quantification. Detection of imported exotic strains of West Nile virus for national biosecurity surveillance. Flavivirus replication - Biogenesis, ultrastructure and functions of induced membranes. The role of the type I interferon in the immunobiology of chikungunya virus.